Hi Friends: Today's post is a summer fun travel tag. It was fun to create, and I used some techniques and products that I've never used before. Please see below for photos, process, challenges, and supplies. Have a super day! I started with a plain manila tag and used the Distress Stain Brayer technique to color the background. Once dry, I distressed the edges with my Distress tool and used my Ink Blending tool and Black Soot Distress Ink to add color to the edges of the tag. I splattered some water to create droplets on the tag. I used my sewing machine to add some stitching randomly on the tag. I used a stencil to add the words with Chipped Sapphire Distress Paint. Once dried, I moved the stencil slightly so that the painted words created a bit of shadow and used black molding paste to add the words and shape of the US. For the US, I used my palette knife to add texture in the "map" to simulate the mountains and texture of the land. I used the Frameworks technique and cut the Chevron out of Grunge Paper and stained it with Chipped Sapphire stain. I cut the frame into some smaller pieces to make it look more like arrows and added it to the bottom of the tag. To help represent things about the states, I cut the inside pieces from blue jean material, corrugated paper, and wood paper, then glued them inside the framework. I tried to add some burlap, but it didn't cut as well as I wanted, so I just used some frayed edges and added it as fringe on the bottom of the tag. I added a metal arrow to the center of the US. I wanted some shimmer (what, who me? ), so I sprayed some Perfect Pearls Mists over the tag. I like the way the shimmer settled in the texture of the states. I finished the tag with some crinkle ribbon stained with Chipped Sapphire and some blue and black fibers from my stash. FABULOUS tag!!! I love that gorgeous sapphire and how you've added so much amazing texture and interest!!! Really awesome job!!! Thanks so much for sharing your tag with us over at the Mixed Media Monthly Challenge blog for our TRAVEL challenge!!! Great tag!! Love the colors and stitching details! Thank you so much for playing with us at The Mixed Media Monthly Challenge!! Very cool tag! 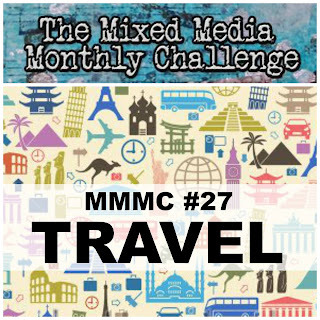 Thanks for joining us at the Mixed Media Monthly Challenge.